Economic Annals is an academic journal published quarterly since 1955 initially under its Serbian name of Ekonomski anali (EconLit) and since 2006 it is published exclusively in English. Its publisher is the Faculty of Economics, a member of the University of Belgrade, which is ranked according to the Academic Ranking of World Universities list, between 200 and 300 best universities of the world (Shanghai). 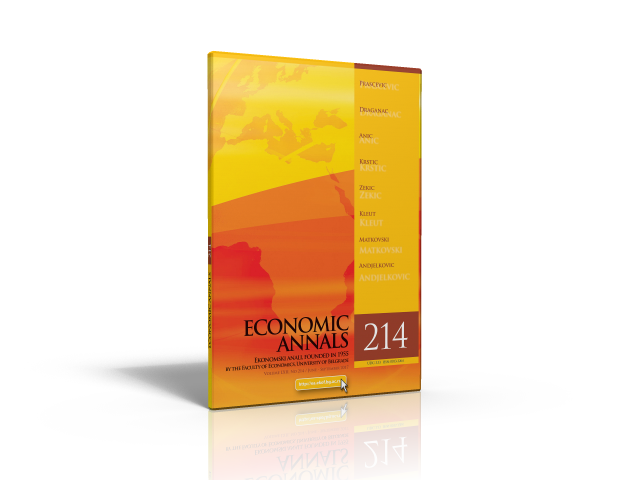 Economic Annals intends to cover a wide range of economic areas, from general to business economics. The journal stimulates publishing of high-quality research papers of both theoretical and empirical character, with a tendency to bridge the gap often occurring between the two. The International Editorial Board particularly welcomes contributions that explore economic issues in comparative perspective and those regarding emerging markets and transition economies in particular. All papers submitted are subject to anonymous reviews and can be published only if two positive references are obtained. The authors are expected to follow the standard publication procedures [Instructions to Authors], to recognize the values of democratic society, academic community and modern economics and to respect the journal’s Policy. The journal is ranked in the Elsevier Scopus® database by SCImago Journal & Country Rank (currently Q3) and is presented in RePec (currently h=4), Ideas, EconLit and Harzing’s Publish or Perish (currently h=15 for the period 2009-2017). The current issue is available on the website, as well as the earlier issues [Archive].